It was a sight to behold – from the ground and from the air. Several hundred people seemed to come from nowhere to gather on the sunny cliffs at Happisburgh yesterday lunchtime. They were all there for one reason: to voice their support for satisfactory sea defences – in a rather unusual manner. The protesters were quickly marshalled into position on the field opposite the Cliff House Teashop, forming themselves into three giant human letters. Some had walked or cycled from Cart Gap, Eccles and Happisburgh. Others had driven from at least as far away as Kent and Cambridgeshire, and there were even a few men and women in wheelchairs and on crutches, who made it to the field, despite terrain that was not particularly easy for them. 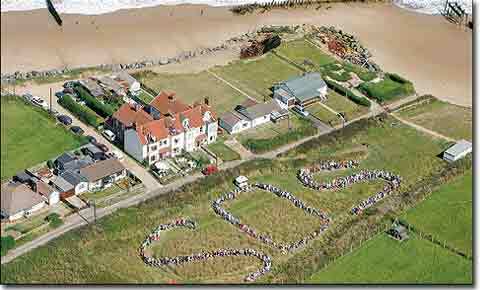 When everyone was marshalled into position, the finished product spelt out the word SOS – standing for Save Our Shoreline. A few minutes passed before the expected arrival of a light aircraft, piloted by aerial photographer Mike Page. The assembled crowd, estimated to number between 500 and 600 men, women and children, cheered and waved as they were first videoed from the air and then photographed. At all times they were under the direction of Malcolm Kerby, co-ordinator of the Coastal Concern Action Group, who was standing on the teashop’s second floor balcony, along with a loud-hailer. The footage and pictures will be used in publicity material to advertise a “self-help” charity being set up to raise money for the village’s sea defences, while pressure is still kept on central and local government to provide a cash injection for Happisburgh. “It was a wonderful event and was a really quintessential example of English village life,” said Mr Kerby. “People have come from all over, there has been wonderful support from across the community. I said I would be the happiest man in North Norfolk if we got 500 people, and we did. The general mood of the crowd was summed up by Gerald Bradley, a regular visitor to Happisburgh from his home county of Cambridgeshire. He said: “It just shows the mix of people who are concerned about what is happening here. “There were people of all ages, locals and visitors alike, home-owners, caravan owners, people who had walked a couple of miles to get here or even driven a couple of hundred miles. There was also a barbecue and tea and coffee laid on to help raise cash towards the Happisburgh fighting fund.